(Chickweed, Common (Stellaria media) - 04) There are about twenty-five species of chickweed growing in the United States. 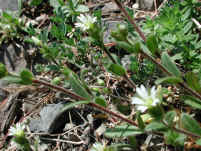 This common chickweed species is the only one that is well known. This small patch is growing in the rip-rap along our shoreline. (Chickweed, Common (Stellaria media) - 05) This is another patch of common chickweed growing among other plants. 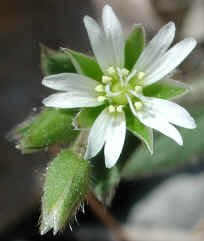 The common chickweed flowers are only about one-fourth of an inch across. To give some sense of scale to the size of the chickweed, note the dry pine needles that stretch two-thirds of the way across this photo. (Chickweed, Common (Stellaria media) - 01) Even the small flowers of God's creation have an amazing amount of detail. 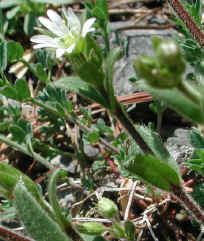 The common chickweed has five deeply notched petals and five sepals. In some species, the sepals are larger than the petals. 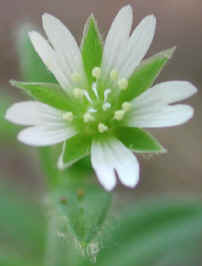 This common chickweed has five styles curling up from the center of the flower and ten stamens stretching out from around the base. (Chickweed, Common (Stellaria media) - 02) Chickweed is a member of the Pink family. Chickweed blooms throughout the growing season and produces a large number of seeds. 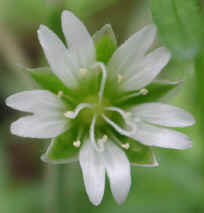 The seeds of the common chickweed are relished by songbirds, which led to its common name. (Chickweed, Common (Stellaria media) - 03) The ten stamens are much more evident in this photo. Note the hairy underside of the sepals on the bud in the lower left of the photo. 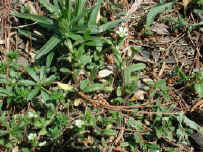 The same hairiness appears also on the leaves and stems. (Chickweed, Common (Stellaria media) - 04a) In this photo we can get a better look at the hairy surfaces of the leaves and stems of the common chickweed. (Chickweed, Common (Stellaria media) - 06) Many people consider the common chickweed to be nothing more than a "common weed" and an unwelcome inhabitant of their lawns. But to us, and hopefully to a growing number of other people, the common chickweed has a beauty and character worthy of being a welcomed guest.